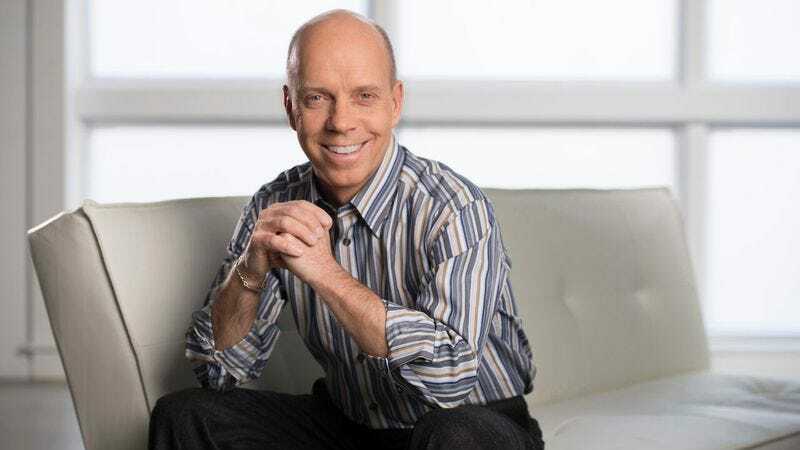 Scott Hamilton is a figure-skating legend. An Olympic gold medalist who also won four world championships and four U.S. championships, Hamilton is still active in the sport, both as a well-known commentator and as an occasional performer in exhibition events. One of those events, Musselman’s Apple Sauce Family Skating Tribute, will air this Sunday, November 15, on ABC. A family-friendly event, the tribute will pair skaters with members of their own families for some ice-based bonding. This time around, Hamilton will be skating with his youngest son, Maxx, who’s seven. Scott Hamilton: This is crazy, but I’ve never had a bad job. I always thought it was miraculous that anyone would hire me. I thought about it for a long time, and I can’t—okay, wait. I can think of one off-hand: I subbed for my brother, who worked at a graveyard near where we live, and I had to fill in a grave. SH: But it was only one day. So it wasn’t like I had a job. It was just the worst working experience I ever had. AVC: But it was your brother’s actual job. SH: Yeah. But, again, I always thought it was a privilege to have a job, period. So I never looked at it as a bad job. I was always grateful to have it. SH: I was a serial loser when I skated. I did okay on the regional level, and mediocre at the sectional level, but I’d get to nationals and just bomb; it was pretty awful. So the first time I ever felt successful was when I broke through all the losing in 1976 when I won the junior national championship. SH: I would use media and pop culture to create an atmosphere of total chaos where leadership is ineffective, and people would basically give up. And then, it would be the easiest time to take over the world. As the super villain, that’s it. How do you win? You make people quit, right? Using media and pop culture is the easiest way to do that because nobody is looking away from their phones, everybody is looking for the next great soundbite and scandal. That would be the easiest way to do it. AVC: And then what would you do? SH: I’d probably think, “It doesn’t get any better than that,” and I’d retire. SH: As a little kid, I always wanted to make people laugh and be the center of attention. And I always wanted to be liked by everyone. I was always trying to be liked, and that kind of laid the groundwork for my professional career. AVC: When did you start skating? SH: I started skating when I was 9. From the time I was very, very, very little, I would do impressions, I would put on shows. I was always trying to make my parents laugh, I was always trying to charm teachers. So I was never going to be a banker. I was always going to be something where people were involved. At least directly in a way that my success or failure was how I was able to interact with people. 5. Who was your celebrity crush when you were a little kid? SH: Well, I had kind of two. Do you remember Kim Richards? AVC: Sure. She’s a Real Housewife now. SH: Yeah, from Escape To Witch Mountain. I always thought she was really adorable, and then she did a movie later on called Tough Turf, and I was like, “Whoa!” She went from being a little kid to being very attractive. And then I always had a crush on Valerie Bertinelli, too. AVC: Have you met either one of them since? SH: No, I’ve never met either one of them. I think I’ll just leave that be. I think I’ll just hang on to those memories. SH: “Short People” by Randy Newman. SH: Because when you listen to it, it’s a song about a lot of things. “Short People” is just thumbing its nose at preconceived notions. I’ve always liked the song, I thought it was clever and humorous, and I’m a short guy. It was my at-bat music for the softball tournament for City Of Hope a couple of years ago. I just thought it was appropriate. SH: I got the kids up and ready for school, fixed them some breakfast. Half of my kids are home on fall break, the others are in school. So I did school runs, then I came home and did some work in my office. SH: It happens all the time, and it mostly happens at hockey games where people think I’m Darren Pang, the hockey commentator. He was a goalie for the Chicago Blackhawks a long time ago. He’s a short guy like me and he’s bald, so when I go to hockey games, people go, “Hey, Panger!” because people think I’m Darren Pang. My aunt is a freak for American Pickers, and they have their store so I took her to that and there was a guy outside the store who said, “Hey, Darren!” and I go, “No, no, I’m not Darren Pang.” And he goes, “Yeah, you are,” and I go, “No, I’m really not. I just look like him, but I’m not him.” And he goes, “Oh, come on! Remember when we played together in that charity golf tournament years ago” blah, blah, blah. So he wouldn’t believe me that I wasn’t Darren Pang, and it was totally random because I wasn’t in a hockey rink. I kept trying to tell him, but he wouldn’t take no for an answer. So he started to get a little bit rough, you know, like, “What are you doing?” like I was trying to put him down, so I called Darren Pang and put him on the phone with Darren Pang. And then he was okay! I totally brought him off the ledge and made it a funny situation when it could have been tragic had I not had Darren Pang’s phone number. And then the other day I was walking out of the elevator and someone was like, “Aren’t you Sean McDonough?” He’s a baseball television broadcaster. So I always joke with people that I look like every short, bald guy in the United States. Possibly the world. SH: Oh, I thoroughly enjoy people and connecting to people, so just put me out in front. I’ll be fine; I won’t embarrass you, I’ll be a good soldier, and make people happy that they’re there. AVC: For what kind of company? Do you think you could work at an auto dealership or in sales? SH: It would be something either in hospitality or where I’d be the icebreaker for a business or something. I don’t know, it could be in reception or something like that. SH: I collect signed guitars. It started because I used to compete in these rock ’n’ roll championships, and the first place trophy was a guitar. So I had three of these guitars, and I really thought they were really cool because I won them three years in a row, then a friend of mine turned 50 years old, and he turned the birthday party into a cancer benefit. And there were two guitars there, so bid on both of them hoping to get one of them and one of them was a guitar signed by ZZ Top, and the other one was a guitar signed by Styx. And so I kept kind of bidding on both of them, and this kid kept outbidding me. So finally the guy whose birthday party it was said that was his nephew and he was like, “What are you doing? Why are you bidding on this? I can get you one for free!” So all the time he was bidding me up. I ended up paying way more for the guitars than I needed to, but it was a cancer benefit, so I was happy to do it. And since then, I had my friends in Cheap Trick sign a guitar to me, then I got KISS, Aerosmith, Hootie And The Blowfish, The Eagles, Neil Diamond. SH: Yeah, I’ve got a bunch. And they’re all classic rock guitars signed by the artists. We go to a lot of events, and in Nashville it seems like there’s always a signed guitar. So I got the Aerosmith one at an event here, and I got the KISS one at an event here, and the Neil Diamond one was at his brother’s fundraiser for their cancer foundation, so I was happy to do that. I don’t even know how I got The Eagles one. I think it was at a golf tournament; a fundraising golf tournament in Los Angeles. It’s beautiful; it’s black and they all signed their names nice and boldly so you can read them all. I’m hoping to find a way to get a silver pen to Don Felder and Randy Meisner to kind of get them to fill out the original Eagles. Because right now, it’s just the big four: Timothy B. Schmit, Joe Walsh, Glenn Frey, and Don Henley. Which is fine with me. AVC: Do you have them displayed? SH: Yeah! I have them downstairs in the basement. We live in the south, so we have a storm room for tornados, and I thought, “Well, I don’t want it to be wasted space, so I’ll turn it into my music room.” So I have a little kid’s drum set for my youngest and then I have my drum kit down there, and I have all these guitars and albums hanging on the wall. It’s pretty cool-looking. I love music. SH: My mom’s beef stroganoff. My mom passed away when I was 18 and she used to make beef stroganoff from scratch. And I’ll tell you what, even thinking about it, my jaw starts to hurt; it was one of my favorite things ever and I would always get really excited when she made it. Bonus 12th question from Maynard James Keenan: If you don’t have a womb, pretend you do. What superhero’s child would you bear and what superhero’s child would you prefer not to bear? Wait a minute, how are we coming about this? AVC: That’s up to you. SH: Okay… what superhero? I guess the first one that comes to mind is Wonder Woman because when you look at all the female superheroes, they all have these wacky powers. For who I wouldn’t like to have a baby with, the only one that comes to mind is the Incredible Hulk. Your baby is hungry and angry and is going to break a person into a million pieces. That’s pretty awful. AVC: And then what do you want to ask the next person? SH: What is the best thing that you’ve ever done for someone else? SH: I don’t know. Because I’m all about paying it forward and gratitude, I guess the best thing has to be my work in cancer. You never know what comes with the seeds you plant. So all the years with Stars On Ice and the skaters who came through and were able to do miraculous things with their philanthropy and charity, all that stuff has been pretty amazing. I would say my 4th Angel mentoring program, where we pair diagnosed patients with mentors of cancer type and treatment type. I realized when I went through my cancer that I didn’t have somebody to tell me, “Oh, that’s normal.” You’re kind of banging around wondering what’s what, and it’s stressful and difficult, so when I survived my cancer, I tried to make it so that didn’t need to be the case anymore. So we started a program called the 4th Angel mentoring program. Basically we put newly diagnosed patients with survivors so they have a role model, they have someone who has been there and done that to show them where the pitfalls and the rough spots are and someone who truly understands what you’re feeling and going through. And now we’re up to 800 mentors. It’s an extraordinary thing to put people together to link arms and it’s a great situation. It’s better than doing it on your own. AVC: It sounds like a great way to help build support in a very personal way. SH: It’s spectacular. It really is.